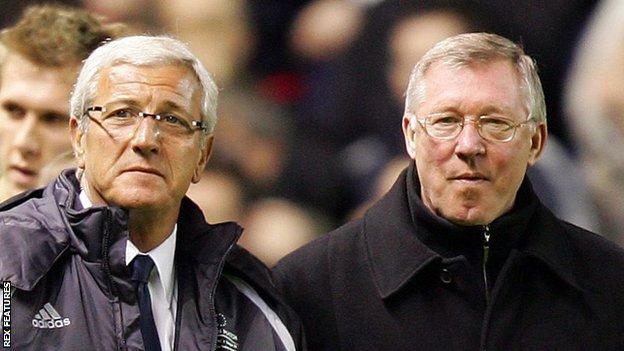 Legendary manager Marcello Lippi hopes Ryan Giggs will flourish as Wales boss, but believes he should look to Sir Alex Ferguson instead of him as a coaching example. Wales' match against Lippi's China on Thursday in the China Cup will be Giggs' first as a permanent manager. By contrast, 69-year-old World Cup winner Lippi is in his 16th job of an illustrious coaching career. "I don't feel I need to give him any advice," said the Italian. "He had the best coach in Sir Alex Ferguson [at Manchester United]. "He just needs to do what he learned from him." Lippi is one of only two managers to have won the World Cup and Champions League - with Italy in 2006 and Juventus in 1996 - along with Vicente del Bosque, who led Spain to the 2010 World Cup and Real Madrid to Champions League titles in 2000 and 2002. During Lippi's two spells in charge of Juventus, the Italian club had several memorable meetings with Manchester United in the Champions League. Giggs scored in United's 3-2 group win over Juventus in 1997 and netted twice in their 3-0 2003 victory in Turin, while Ferguson's men recorded a 3-2 triumph at the Stadio Delle Alpi on their way to being crowned Champions League winners in 1999. Giggs has now moved from the pitch to the dugout and, after a brief spell in interim charge of United in 2014, he will face Lippi again as a fully-fledged manager in Nanning on Thursday. "It'll be great in my first game to go up against one of the greats," said Giggs. Having admired Giggs as a player, Lippi hopes the former Wales captain will prove equally successful as a manager. "I want to meet Ryan Giggs because I remember when I was manager of Juventus at the end of 90s we played many matches during the Champions League," he added. "It was Juventus against Man United so many times. "He was an extraordinary player, very strong, I really like him. "I hope he will become a very good coach as well. I wish him all the best." After facing China Wales go on to play either Uruguay or the Czech Republic on Monday, 26 March.